When was the last time the soil was changed? Clean the the pot too. I am writing from Mexico and I wanted to tell you about the jade plant I rescued over a week ago. There was a beautiful though a little bit “bald” jade plant (approx. 1,5 feet) growing near the subway station where I arrive every morning to go to work. One day (maybe in early January or so) I noticed that someone had ripped the plant from the soil and left it leaning against another jade plant. I expected that someone would do something but as the weeks passed by, nothing happened and the plant was there, not properly planted, roots exposed and without any watering or care. Over a week ago I just decided to do something about it and take the plant so I went there, put it into a huge plastic sack and brought it home. It was very dry and the leaves were dropping and those still left in the plant were wrinkled and soft so the first thing I did was to put it into a bucket with approx. 5 inch. of water and I left it there for about 24 hours. Then I replaced the water with a little bit of soil to cover the roots (all I had at that time) and left it until I got a pot for it from the local market. On Sunday I finally managed to pot the jade but I haven´t watered it yet, I wanted to wait a couple of days before watering it properly. I keep it outdoors, not in direct sunlight but it gets some especially in the morning and noon. Please find enclosed a couple of pictures of the plant. What do you think, will it recover? Should I water it more frequently since the climate in Mexico City is warm? There is the rainy season from June until October or so, before that it’s going to get pretty hot and dry here. There are many jade plants growing in the parks and it seems that they are not cared for, they just grow there happy and healthy and look fantastic. The pic 0038 was taken after I had brought it home, the pic 0039 (2) was taken after potting and some careful pruning (I had to do it because it was overgrowing) and the last pics were taken of the leaves, still a bit wrinkled but apparently recovering. I appreciate any comments. I like your jade plants! First you need to send me a plane ticket so I can see the jade plants. Yes, you are doing well with the plant. Right now, the jade plant is dehydrated. Wait a couple more days and the leaves will be perky and jiucy. Jade plants are very hardy. In Thailand/Malaysia, the jade plant aka the Money Plants grow outside and they thrive very well in the hot humid weather. I would water it once every 10 days. Look at the leaves, if they are dry then they will be wrinkles. The leaves should be thick, moist and juicy . It takes a couple of days for the the jade plants to adsorb the water thru the trunks and then to the leaves. I live in Minnesota, I will take your advice & water every 10 days, I have noticed on my other Jades that they are starting to get wilted now. I’m going to water them now. I really don’t want to loose them. Good Job. Just keep an eye on those leaves. The leaves will tell you how healthy they are. I have a couple of jade plants that seem to get top heavy and fall over. Do I water too much or need a heavier soil? What do you mean top heavy? the Jade plant falling over because of too many leaves on top? If that the case, get a bigger pot and support it with a pole. Let the trunk gets bigger until it can support the whole tree. It is best to prune the top too. If you like, send a couple of pictures. I can not believe I stumbled across this website… I am so happy! I have a baby jade that I took as a cutting from some ones yard in California and brought back to Nevada. I can not wait until she is ten years old! I can only hope she looks as amazing as your jade! Thank you so much for such a great site! I see some new growth on my Jade plant that I cut back to the large branches. Yea!!! I love Jades but I have a hard time keeping them alive. I have just received a small jade bonsai. It is about 8″ tall. Right now it looks like a softball on a stick. Not trimmed at all. I don’t know how to start pinching it to make it look like a bonsai. Also, I live in Florida. Should I put it outside on the lanai (in the shade)or is it too humid here? Help! I have just received a small jade bonsai. It is about 8? tall. Right now it looks like a softball on a stick. Not trimmed at all. I don’t know how to start pinching it to make it look like a bonsai. Also, I live in Florida. Should I put it outside on the lanai (in the shade)or is it too humid here? Help! When comes to Bonsai, you need to prune it slowly. Trim once per month so as not to stress out the plant. That why you need lots of patience when comes to bonsai. Yes, in the shade is the best place and no direct sunlight. It will burn the leaves if it is too hot. I replied on your Jade plant forum on the website (the post is below), and am emailing the pictures of my young-ling as promised. The ‘Y’ can be seen well in 625, and the small shoot growing alongside can be seen in 624. Please let me know if the file sizes are too large. Thanks again! I just spent a weekend at home and had a chance to visit my Grandmother. She has a jade plant about the size of the one in the first picture, though the trunk is slightly skinnier. I instantly fell in love with the plant, of which she gave me two baby trimmings about 6″ in height and 0.5″ in diameter. They are growing healthily, and though I have been watering often (maybe too often), have been pretty resilient, with lots of new leaves on the way. I have emailed you the pictures. PS. I just remembered, the little guy enjoys about 3 hours of direct sunlight each morning in his east-facing balcony (I open the balcony door so that the light is hitting him directly, not traveling through glass). Is this healthy or should direct sunlight be avoided entirely? He seems to be enjoying it, though I don’t quite know what a burnt leaf looks like. Thanks again! “there is a small chute sprouting to the side”— cut that off and put it in another pot. It will grow in her own pot. It is best to have one big main trunk for the jade. Looks better and it is healthier.Easier to manage. Now you have a total of 3 jade plants!!! then just dip into a new pot with clean soil and give her to your neighbor. My baby jade is getting pretty thick in the trunk but the branches are starting to get all spindly. That happened with my last one and it ended up dying. It’s potted indoors (repotted it maybe 2 months ago). Can I prune some of the leaves from the bottom to encourage thicker trunk growth and for the top part to get a little thicker? Did you change the location of the pot? Nope, the pot has pretty much been in the same place. So I should just cut some branches completely off? Or just some of the leaves (and if so, do I do that at the top or bottom?). JADE TRUNKS THE SIZE OF ELEPHANT LEGS!! i AM LOOKING TO HELP HOMELESS PETS WITH THIS JADE…. CAN YOU HELP BY POINTING ME IN THE RIGHT DIRECTION, PLEASE? I’m just a single individual,…(not a grower, a nursery, or any other biz entity)…who is moving into this apartment with the untended yard, and I have the apartment owner’s blessing to clean it up. I am located in San Diego, CA. IS THERE A WEBSITE THAT TARGETS BUYERS OF LARGE JADE? Do any of you know?….or have another suggestion? I realize I could just post an ad on craigslist, but I believe there must be a better way/place to actually reach the specific type of Buyers who would be interested in plants of this size and beauty. The plants are truly BEAUTIFUL!! I have all sizes…(1.5ft to 6ft tall and 1ft to 4ft wide)…and many have 1ft-4ft TRUNKS…(and DOUBLE trunks)… the size of elephant legs, which then branch out beautifully, as though they have been trimmed by a BONSAI master! Some pieces come with the roots, but the majority are clippings without roots…. (which, of course, are easy enough to grow). If anyone has any useful suggestions, I’d greatly appreciate your input. I just bought a baby jade plant and it came with multiple small trunks…but i have always wanted a big trunk jade plant…any advice on how to encourage the trunk to grow larger? should I separate them? I think there are at least 6-8 small trunks in the plants and i am picturing a nice 2 big trunks in a v shape plant type of thing. Yes, separate those trunks . What price are you asking? 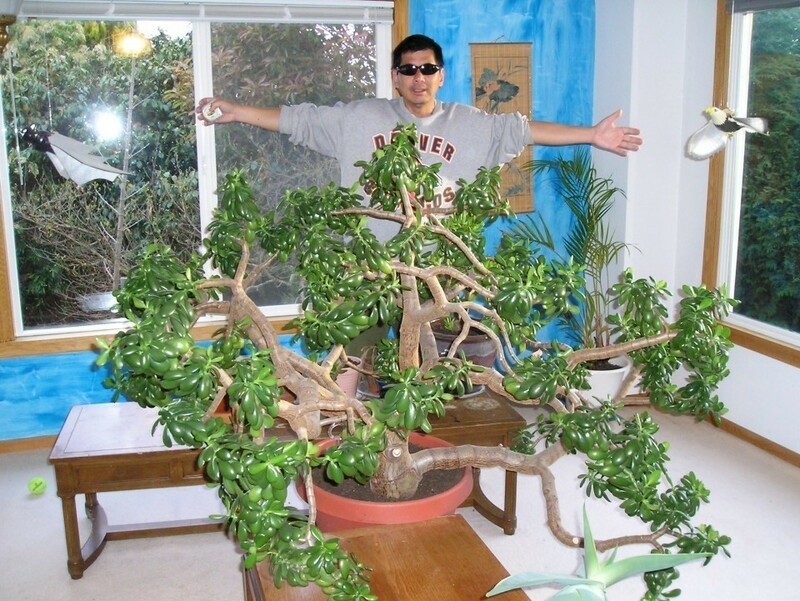 Id like to purchase one of a medium to large jade tree. I have one that I bought and it is a beauty. Id like to have another. Where are you located and what size are you referring to? dear jade master. my brother passed away suddenly 2 days ago and I have inhereted his jade plant. It appears to be in very good condition he loved his plants. It is about 2 feet tall and it seems like he has bonsaied it because the bases are like over an inch thick. I am pretty good with plants i have 23 house plants 2 jades they are doing well but have not grown much in two years. It would break my heart if I killed my brothers prize plant. Please advise thank you. Sorry about your brother’s death. If the jade plant is in good healthy condition, just give her the TLC…sun, water , food and lots of love. Hi Jade Master – what is the “food” you speak of for the jade? Just plain soil? How often do you change it? Also, if my one pot has 4 small trunks should I transplant all but one to individual pots? I just use the indoor potting soil bought from Home Depot. Nothing expensive. I changed the soil once every 2 yrs or when the soil feels like dust. I don’t even use the fertilizer spikes or sticks. All I give to my jade plant is lots of love and care-TLC- and I treat her like my Lady. Yes, I would put one truck on one pot so it will grow better and stronger. just water once per week. Can a Jade be grown in an office environment under the fluorescent lighting? It stays relatively cool here, so temp wise wouldn’t be an issue, just wondered how it would do under the tube lights? Enjoying learning about my new green friend the Jade. Thanks! It will grow but at a very slow slow pace. It is like trying to grow tomato at 50s degree with no sun. Ok, thank you for your quick reply! I hada giant jade, about 25 years old. My landscaper killed it but is willing to replace it. I can’t find a jade as big as mine. Any ideas? Good luck finding a giant plant like mine, what you are buying is time. i bought a small jade plant last year that is growing like a wild fire. i have taken cuttings and now have loads of smaller plants what seem to be doing well. my question is though. the main plant is growing so well that the length of the main arms cant support themselves too well. i hate to have to cut the tops off them, but i dont know what else to do to make the arms thicker and stronger. at the moment the plant is only around 12 inches tall at most, but is got canes around it to try and hold a decent shape. my aim is to get a good compact shape to it. any advice on what to do would be much appreciated. Congrats on growing the jade plant very well. Yes, cut the canes around the trunk so all the energies go to that main trunk. You can give away those small cuttings to friends as X-mas gifts- save you lots of money. Just got my first jade she is very small. im taking her to college with me and when I become a teacher into the classroom. I need tips on caring for a young jade plant to make her grow strong and healthy. I am new at this. Since you are the jade master do you have any tips for a young apprentice? Just take care of jade plant just like you take care of the little kids in your class-teacher. Lots of TLC, good soil and indirect light. Oh, no smoking and no drinking. Good luck to you and after you graduate, email back to me and I will send you one of the big limbs. Writing to your from the big island. I have just received a few jade plants, various sizes. I have kept them outside under the sun and in the rain. They are doing great! However I am concerned about the soil. How often should I change it? If you like, you can fly me out to your big island and I will personally take a look at those plants. I changed my soil every 2 years. What kind of jade plants do you have? I have seen jade plants in Malaysia and Thailand and they are in pots and they grow very well under the tropical heat. Propagate pruned parts of the jade plant by inserting the cut ends directly into soil. I was given a jade plant and in the one pot there is 5 trunks , is that ok to leave the plant like that or should I separate them. Also I seen a video that if you keep trimming back on the leaves it will help thicken the trunks , will that help? You mentioned that you use nothing out of the ordinary, but what brand of plant food do you use? And do you use only potting soil that has not been mixed with extra pearlite or sand? I have a jade plant in my garden, perhaps planted too close to a wall. It has grown like crazy and is very healthy, but it tipped over. Should I relocate it? It gets morning sun, but could it be stretching for afternoon sun? Like I said, it’s very healthy, and I can’t believe how fast it’s grown. I’m in Southern California. yes you can move the jade plant . Outdoor jade plants are very hardy.